Hello my dear readers, nope, I don't just wanna skip winter with this post, I simply don't have much time to do any new outfit, lifestyle or Mallorca posts because I'm pretty occupied organizing my bachelor thesis so I can start writing, selling furniture to get ready to move to Mallorca and arrange more things one's gotta get done before moving to a different country. So today I wanna show you some photos of my first blogger event ever which took place on Mallorca last September. Until then I had never really been very interested in blogger events, don't get me wrong, I love connecting with other bloggers but I do it privately for other, non-commercial reasons. So when Laura, who owns the blog Laura Mallorca, invited me to a GBN Trends blogger meeting on Mallorca I just couldn't say no. GBN Trends is a blogger network who organizes blogger events in Germany and other countries on a regular basis. 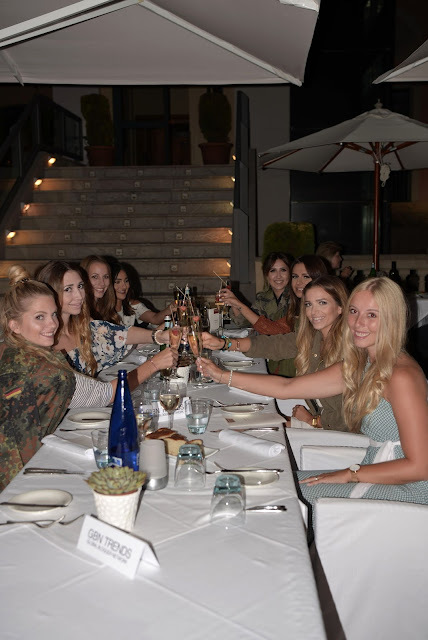 The event they organized on Mallorca was a great opportunity for me to meet other girls who own wonderful, professional and succesful blogs, social media profiles or YouTube channels and are real experts. That day I met Luana, who blogs on luana-silva.com, Jana who owns a great blog and the YouTube channel schannaloves, Jasmin who posts very cool videos on her YouTube channel Madametamtam, Karina who you can find on Instagram as tsche_rajna, Carolin of Cocoswonderland and Xenia of Glamourlovexoxo. We had a great day shooting some pics at Cala Cap Falco, a small beach not far from Palma, having lunch in Port Adriano and dinner at the Steigenberger Golf & Spa Resort in Camp de Mar. I personally enjoyed the dinner most because we finally got the chance to quietly sit down and talk to each other instead of taking photos and running around. I got to know the girls better at the end of the day and loved all their inspiring stories about their blogs but also their personal ones about boyfriends, pets, family and fashion. I think blogger events are a great chance to meet fellow bloggers, gain insight into their work as professionals and get to know them personally. Plus, most of the time you get to do fun stuff, haha. Thank you GBN Trends for the great opportunity, I had a wonderful day with these ladies! PS: That day I only had my phone with me so the more professional photos were taken by by RandomPace and others by me. Desde luego una maravilla..vaya reunion..un saludo desde Murcia..y Feliz año. OMG, wie wunderschön ihr alle ausschaut! :) Das war bestimmt eine wundervolle Zeit! So while it's true that the people make an event (and the people definitely made any event!) this space definitely adds a different dimension to it. Went to Los Angeles event venues for an evening event and I was really impressed.